This is by no means a complete list of local hotel accommodations. Here you'll find some simple recommendations with reviews of many hotels in our resort area. 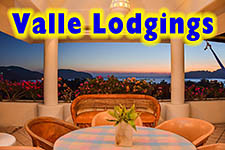 For a complete listing of local hotels and other lodgings' websites on the Internet please click on the link for the appropriate Directory for either Zihuatanejo, Ixtapa or Troncones listed on the homepage. 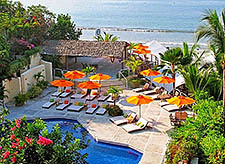 Casa Iguana - Six luxurious bungalow suites located a few steps from the beach at Playa La Ropa. Amenities include A/C, cable TV, Internet connection, kitchenettes, and terraces with living and dining areas. 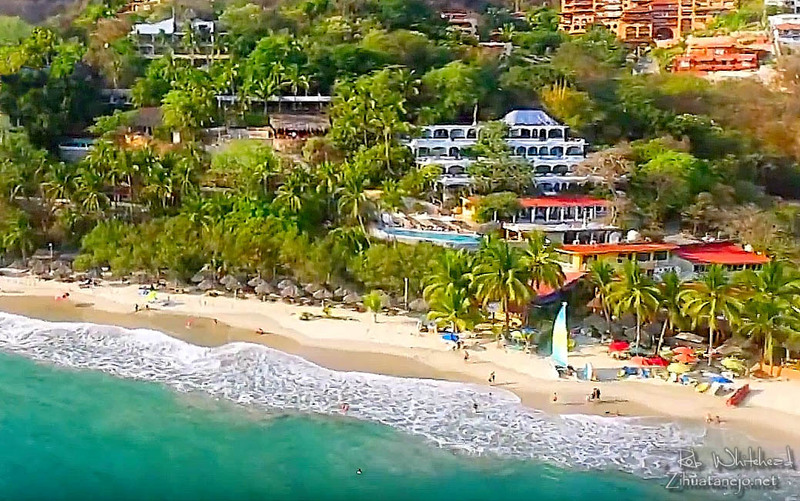 Catalina Beach Resort - Zihuatanejo's first beachfront inn offering bungalows for vacationers, established in 1952 on a lovely section of Playa La Ropa. 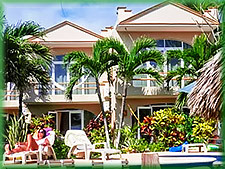 Your hostess, Eva, the long-time owner with her loyal, efficient and friendly staff, offers a variety of bungalows and suites along a small, terraced rise that includes a large beach area with lounge chairs and large palm-frond (palapa) umbrellas. Enjoy breathtaking views from the infinity pool and the popular Sunset Bar. Hotel Cinco Sentidos - A beautiful retreat with only five uniquely appointed suites, located on a hillside above La Ropa Beach with spectacular bay views, private terraces with mini pools. Hotel Villas Las Azucenas - An enchanting small boutique hotel with a pool located just a few steps from the beach at Playa La Ropa featuring 3 Master suites with an ocean view, mini-pool and kitchenette, 8 Suites with kitchenettes, 5 Junior suites with kitchenettes, and 5 Standard rooms without kitchenettes. The public areas of the hotel have wi-fi broadband internet access. Regalo del Mar - A uniquely Mexican small, exotic, luxurious tropical-style vacation guest inn on the beach at Playa Troncones with comfortable suites, bungalows, and a pool. Surrounded by exuberant gardens and natural beauty, it's a place for nature lovers, peaceful and ideal for relaxing far from anything resembling stress,. 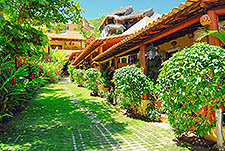 Arecas Suites - A small hotel located in "the grove" at La Ropa in Zihuatanejo near the beach. Features 8 air-conditioned suites with kitchenettes and a pool. 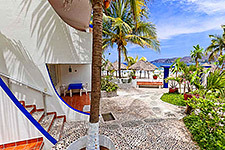 Aura del Mar (formerly Brisas del Mar) - Affordable beachfront boutique hotel with a pool offering Mexican charm and homestyle hospitality, conveniently located on La Madera Beach, just 5 minutes walking distance from downtown Zihuatanejo. All suites have a private terrace overlooking the bay, A/C and internet access. Bungalows Pacíficos - A small iconic Zihuatanejo oceanfront vacation inn located in La Madera featuring 6 suites and a small house, all with one bedroom with a king-size bed, air conditioning, kitchen, and terrace. The suites also have two single beds and the small house has a twin-size bed for family or friends. Bungalows Vepao - Comfortable rooms and suites, many with kitchenettes, all with wi-fi. Pool on property. 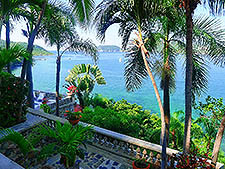 Located in a garden setting on the waterfront at La Ropa Beach in Zihuatanejo. Canto del Mar - A family-run inn featuring spacious air-conditioned suites with kitchenettes, pool, parking and internet access. Located in a quiet corner of La Madera neighborhood near several restaurants and less than half a block from the beach. Casa Azul (Troncones) - Guest inn with 2 one-bedroom suites located in a quiet tropical jungle garden setting less than 2 blocks from Troncones Beach, close to convenience stores and several restaurants. Includes A/C, cable TV, wi-fi, a ground floor sitting area, an upstairs terrace under a palapa. and a well-equipped kitchen. An oasis in paradise! Casa Villa Palmira - A small bayfront inn offering 6 vacation suites in a very peaceful colonial style property with a pool located amid the palms at the far end of Playa La Ropa. Each suite is air-conditioned and has a kitchenette, terrace, wi-fi internet, and cable TV. El Manantial - A small family-run inn with two one-bedroom bungalows and two houses, one with three bedrooms and the other with six, located on the beach at Playa Blanca, perfect for honeymooners. Each bedroom has air-conditioning, and there is wi-fi internet, a pool and an outdoor lounge area. 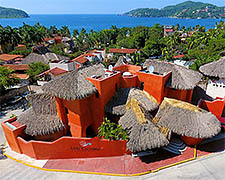 Hotel del Pescador (formerly Hotel Ávila) - The only hotel located on the beach, Playa Principal, in downtown Zihuatanejo within easy walking distance of the pier; medium-priced with a great view of the bay. All rooms have A/C, TV, and telephones. Large terraces and beachfront restaurant "Tata's". Hotel Emporio Ixtapa (formerly the Riviera) - An affordable resort hotel with a Mediterranean flavor on the beach in Ixtapa offering rooms and suites, restaurants, bars, tennis courts, and a beachfront pool. Hotel Los Sueños - This enchanting oceanfront inn offers 6 one-bedroom suites, a two-bedroom family suite with kitchen, and a "cozy" surfers room also with kitchen, queen-size bed and bunk bed. All rooms have A/C, fridge, hammock, wireless internet, and there is a pool on the property. Located on Playa Troncones within easy walking distance of the village, restaurants and convenience stores. 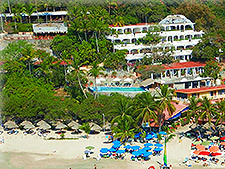 Hotel Palacios - A very nice family-run hotel on the beach at Playa La Madera. Rooms with A/C. Terraces, pool and a view of the ocean. Tel. & Fax: (755) 554-2055. Mailing address: Apdo. Postal #57, CP 40880, Zihuatanejo, Gro., Mexico. Hotel Pipo - A clean family-friendly economical lodging in downtown Zihuatanejo on Cuauhtémoc street across from Cuauhtémoc Plaza near the Municipal Library offering a total of 14 rooms, some with kitchenettes, all with A/C, cable TV, and internet access. Includes a pool, daily maid service and parking. 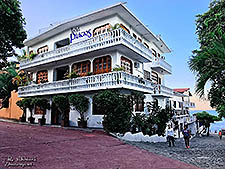 Hotel Plaza Zihua - This small, family-run lodging is the only hotel right on the main plaza in downtown Zihuatanejo overlooking the plaza as well as the beach and bay. Care has been taken to provide for peace and quiet in their rooms when you don't wish to listen to events in the plaza. Hotel Solimar Inn Suites - These are very nice, clean and well-equipped rooms in Zihuatanejo for those who don't mind not being right on the beach. Save money and enjoy a few extra nights in our little paradise. Madera Beach is less than a 5-minute walk away, town is less than 10, the market is also about 5 minutes away. Modern rooms, a pool, cable TV, A/C...all the bells and whistles! Check out their discounts for long stays. Hotel Villas Paraíso - The perfect place for the whole family in Ixtapa offering suites with kitchenettes. Features a large swimming pool and a wading pool for the kids, a tennis court, wireless internet, and a restaurant. Near shopping, restaurants and night-life. Less than a 5-minute walk to El Palmar Beach (about one block away). Tel. (755) 553 0194. 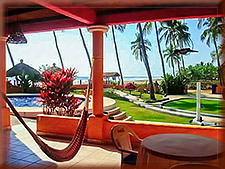 Inn at Manzanillo Bay - An eco-lodging Bed & Breakfast located on the beach at Playa Manzanillo in Troncones with 9 individual bungalows in a quiet tropical setting around a pool and restaurant. An excellent location for surfers. 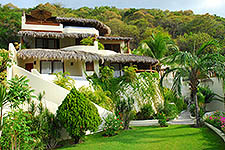 Mi Casa Es Su Casa - Comfortable suites, rooms and bungalows fronting the beach at Troncones. Located within easy walking distance of the village. Features an oceanside pool and a restaurant. Playa Potosí Resort - Small oceanfront inn offering four 1-bedroom bungalows with a pool set amid the shade of coconut palms and located on the beach at Playa Blanca. 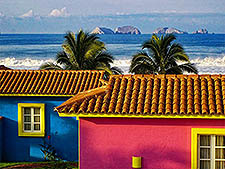 Twenty minutes from the airport and easy walking distance to numerous restaurants in the village of Barra de Potosí. Posada del Palmar - A small family-owned and operated economical hotel on Paseo del Palmar on the edge of downtown Zihuatanejo within easy walking distance of La Madera Beach as well as the restaurants and shops of the downtown area. Quinta Camelinas - A small family-run inn located in the quiet residential area of Dario Galeana 2 short blocks from La Madera Beach and within easy walking distance from La Ropa Beach and downtown Zihuatanejo, offering a total of 6 air-conditioned rooms and suites including a 2-bedroom penthouse. Includes free wireless internet access and cable TV. Raúl 3 Marias - Centro - One of the best bargains around, located half a block from the beach in El Centro near the Mexican Naval base and Municipal Pier of Zihuatanejo, Mexico. 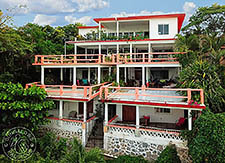 Villa Cruz del Mar - A lovely colonial-style home converted into a small family-run hotel featuring 7 comfortable air-conditioned rooms, some with kitchenettes, all with cable TV, surrounding an enclosed garden courtyard with a pool. Free wireless internet access and secure parking. 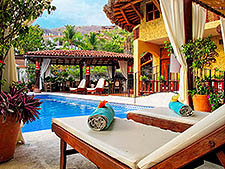 Located less than 100 yards from the beach in La Madera neighborhood of Zihuatanejo.